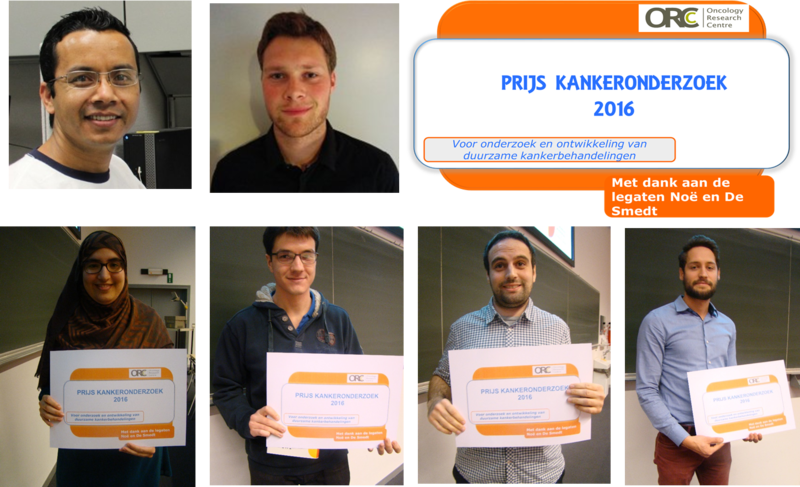 On October 26th 2016 during the fifth edition of the ORC day, the award ceremony of the “Prijs Kankeronderzoek” took place. Six PhD students were selected for a starter scholarship or finishing scholarship with their project that is involved into various disciplines of cancer research. The candidates are Yannick De Vaeminck (LMCT, Molecular and cellular therapy, VUB), Sarah Melhaoui (LMCT), Sven de Mey (TROP, Translational Radiation Oncology, supportive care and Physics, VUB), Rajendra Bahadur Shahi (LMMO, Medical and Molecular Oncology, UZ Brussel), Amir Noeparast (LMMO) and Pieterjan Debie (ICMI, In Vivo Cellular and Molecular Imaging Center,VUB ). Can epigenetic treatment restore the immune system in multiple myeloma?